Entertaining and educational volume with general information on dinosaurs. This actually surprised me with how pleasing the presentation is. 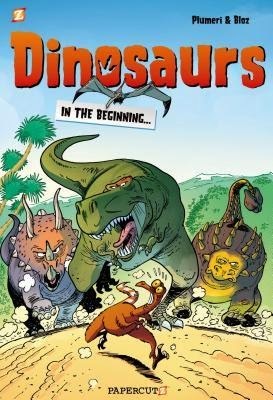 The first volume of a series, this covers a multitude of different dinosaurs and various general information about them. The back includes a term index and list of dinosaurs covered with stats. The book is presented with an instructive narrative and humorous panels as the giant lizards talk to each other illustrating the narrative. There are a couple of recurring characters: the narrator, Indino Jones, an intelligent, friendly but slightly muddled paleontologist and his pet dog; and within the dinosaur eras a compsognathus nicknamed Compso who interacts with the dinosaurs. I'm not big on dinosaurs myself, but I found the book entertaining and the humour cute and funny. Kids with a passion for dinosaurs will get a kick out of this series. Same set up as volume one. Entertaining and educational at the same time. I found the humour to be quite funny and even on the dark side. There are a lot of carnivores attacking and munching their prey while making funny comments, so probably not for the most sensitive of kids. This book also covers a wide variety of general information and trivia about dinosaurs, the different eras and palaeontology. The title "Bite of the Albertosaurus" has nothing to do with the contents; I think Albertosaurus was shown only about three times. Compso is still a sidekick character but he appears much less frequently and is hardly ever referred to by name, instead two rats introduced towards the end of volume one appear more often and seem to take over the part of interactive recurring characters. 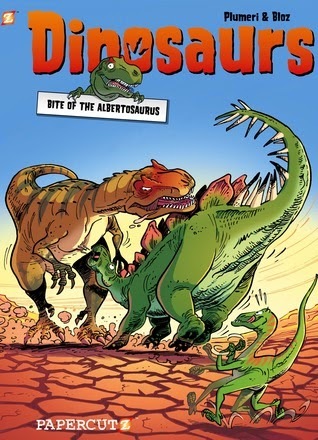 A fun, interesting book about dinosaurs with lots of humour that dinosaur fans will enjoy. I'm just disappointed that this volume didn't narrow down its topic.